This item is correspondence received by the Adjutant General's Office. Josiah B. McAfee succeeded Thomas J. Anderson as Kansas Adjutant General in August 1867. The correspondence includes letters from citizens seeking to reenter the armed forces, orders for the disarmament of state militia arsenals, and claims for service records and pensions. 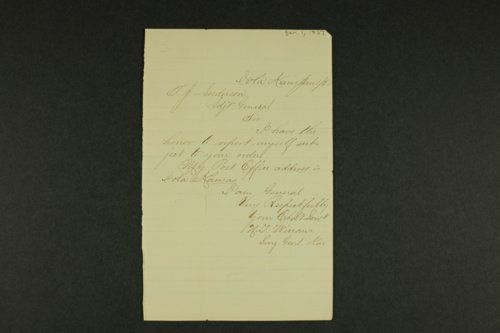 A letter, dated June 25, 1867, from former Kansas Governor Charles Robinson, states that a list of officers commissioned during his term is no longer in his possession. Also included are several statements taken by district court clerk Mitchell G. Williams in New Albany, Wilson County, Kansas, regarding the theft and killing of horses by Osage Indians.